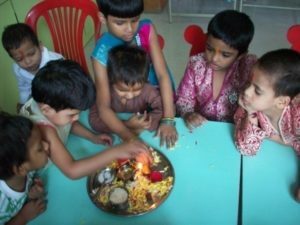 The last day of Diwali –‘Bhau beej‘ was celebrated in a traditional way on 1st November 2016. Children were happy and had a feast of mithai. On the day of the festival, sisters invite their brothers for a sumptuous meal often including their favorite dishes/sweets. The whole ceremony signifies the duty of a brother to protect his sister, as well as a sister’s blessings for her brother. Carrying forward the ceremony in traditional style, sisters perform aarti for their brother and apply a red tika on the brother’s forehead. This tika ceremony on the occasion of Bhai Bij signifies the sister’s sincerest prayers for the long and happy life of her brother and treat them with gifts. In return brothers bless their sisters and may treat them also with gifts. 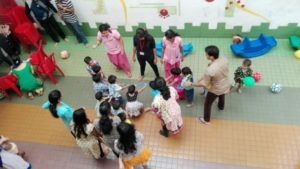 Volunteers arranged a fun filled evening for children on the Children’s day. 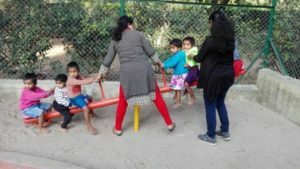 Musical chair, tug-of-war and a dance session was arranged for children. All the children enjoyed the party. 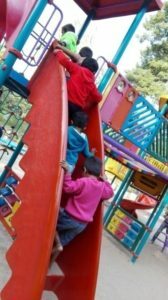 Children’s Day is celebrated on 14 November, on the birthday of the first Prime Minister of independent India, who was fondly called Chacha Nehru (Uncle Nehru) or Chachaji (Uncle), and who emphasized the importance of giving love and affection to children, whom he saw as the bright future of India. To give him tribute, India celebrates this festival on 14 November, the day of his birthday. It was established as a holiday in 1964. Many functions are organized in schools, offices and other organizations. Most schools hold cultural performances on this day, run by the children themselves. Teachers also get involved, and may perform songs and dances for their students. On this day, the State and the Central Government also make it a point to showcase children’s films as part of Film festivals organized in many parts of the country. 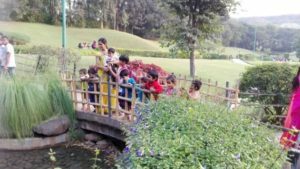 Children visited the P L Deshpande Garden, Pune on 9.11.2016 along with staff members and volunteers and had a lot of fun and frolic. 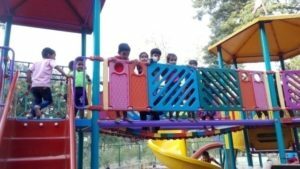 Children were overjoyed to play on the swing and slide down on the slides. KSB Pumps donated 5 Defibrillators (Life saving device for patients having sudden cardiac arrest) to the Sasoon General Hospital through SOFOSH. 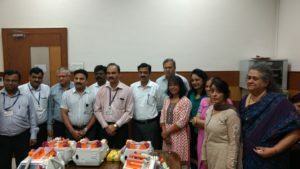 The handing over function was arranged on 16th November 2016 in presence of the dignitaries from Sassoon hospital/B. J Medical College, KSB Pumps and SOFOSH. 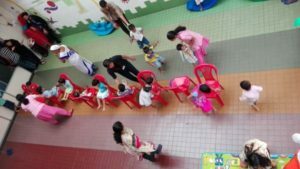 It is observed that many couples want to adopt a child but they are skeptical about the procedure of adoption. 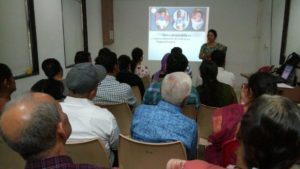 An adoption awareness program was arranged on 19th November 2016 at Shreevatsa. 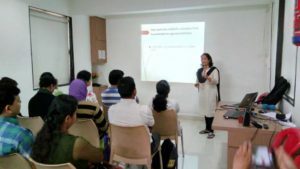 The main objective of this explanatory discourse was to promote the awareness of adoption among prospective adoptive parents and even among the general public.